Persistence of vision is an optical illusion, which commonly happens if an illuminated object moves faster than 1/25 second to complete at least one expected path. 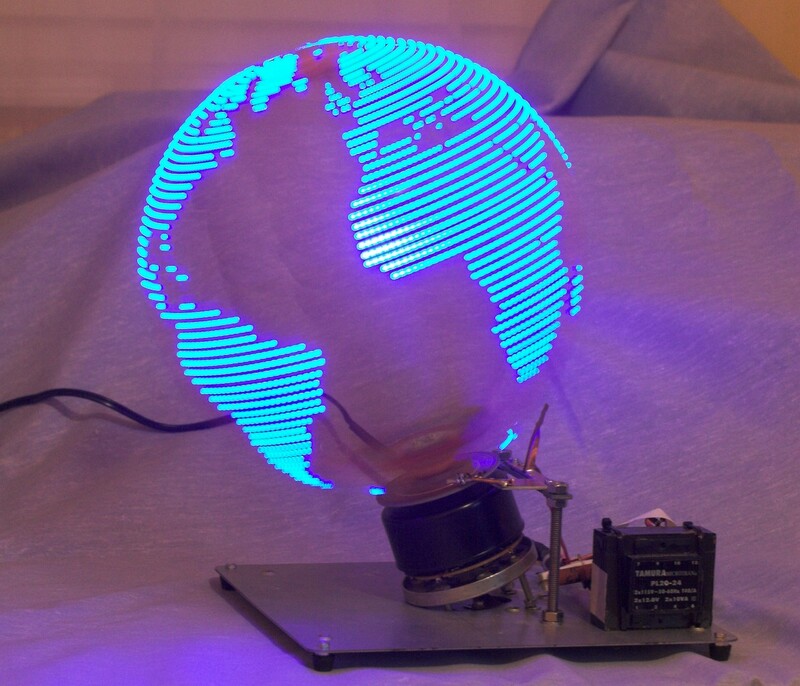 Easiest example is rotating a bright LED in a circular way creates a virtual image of a circle. Persistence of vision in DIY Electronics is Used To Create Beautiful Animated Texts, 3D Objects, Basic Line Drawings, Clock With Simple LEDs. Persistence of vision phenomenon still important in the field of film history and theory. In the early days of cinematic innovation, a rate of less than 16 frames per second could cause the perception of flashing images. The movement remained readable even at a rate of 10 frames per second or slower (like a flip book), but the flicker caused by the shutter of a film projector becomes distracting below the threshold of 16 images. A film on film is broadcast at 24 frames per second. The digital cinema system advertises to other frequencies (including 25 fps, 30, 48, 60, etc.) through digital screening copies (DCP). It is important to distinguish between the frame rate and the rate of flickering light, which are not necessarily the same. In physical theater systems, it is necessary to pull down the image of the film. In digital cinema systems, the scanning speed can be separated from the image refresh rate. In some systems, such as Digital Light Processing System (DLP), there is no theft spot or raster scanning for all. For persistence of vision, the idea is to store the virtual image into a sequence of columns. Each column should be stored in such a way as to efficiently send them to a column of LEDs all at once. Finally, the main loop of the program should just start pushing out the virtual image, one column at a time, through the whole pattern. space became . and all others became *. For the HP’s Logo as ASCII image, we need a row of LED equal to the number of original ASCII art’s (that logo here) number of characters in horizontal direction. That is 45 for the example. One row of 45 LEDs will “scroll” the full logo via that one row of 45 LEDs. There are around 55 lines on that image. If we move the 45 LED sitting on panel 24 up-down per second, it will appear as if a full 45 x 55 LED panel is creating the image. So, actually that 45 LED sitting on panel is scanning. Easiest way achieve this is spinning the 45 LED sitting on panel with a motor. But, there will be distortion as the panel was for 24 up-down per second to create the image but we are giving it an angular pattern of movement. Some trigonometric calculation will be needed to make it a practical logo. They can be programmed. There are ready programs DIY Arduino compatible boards available with LED attached on the board for this purpose. Kindly do not rotate your original Arduino board at 1000 RPM with battery. Original Arduino board costs higher and frankly it will die if slips away. This Article Has Been Shared 6498 Times! You should know that a battery has a limited life span (2 years). In addition, it will gradually lose its capacity for autonomy. It is therefore important to take care of your laptop’s battery. Autonomic Computing not to be confused with the more demanding Autonomous Computing Systems of artificial intelligence or robotics in cognitive science. Netbook and Notebook has certain differentiating points between them. Netbook is not the same as a Tablet PC. Also Android Tablet or iPad is not a Tablet PC. What SIP Trunking is – SIP Trunking is based on Session Initiation Protocol (SIP). It is for Voice over Internet Protocol (VoIP) and streaming media. Cite this article as: Abhishek Ghosh, "Persistence of vision in DIY Electronics," in The Customize Windows, November 7, 2015, April 21, 2019, https://thecustomizewindows.com/2015/11/persistence-of-vision-in-diy-electronics/.